You can't go to NYC without trying some 'New York style' pizza - and that we did, on several occasions. 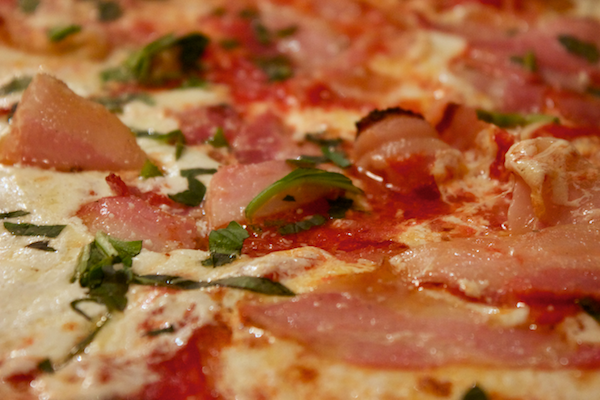 We're not pizza snobs and we definitely don't discriminate when it comes to styles of pizza, but we were curious to find out what all the fuss was about. 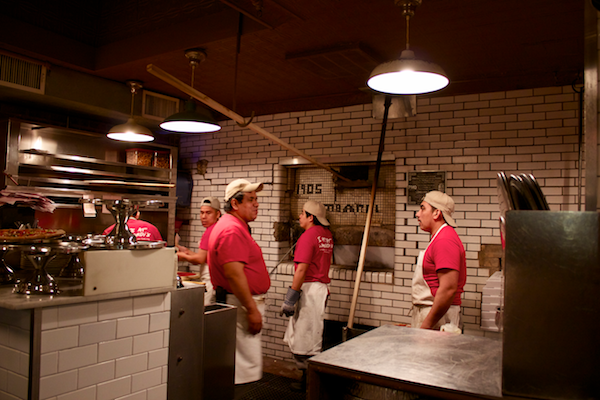 When we solicited you guys for recommendations of NYC pizza places, we got some great suggestions (thank you)! 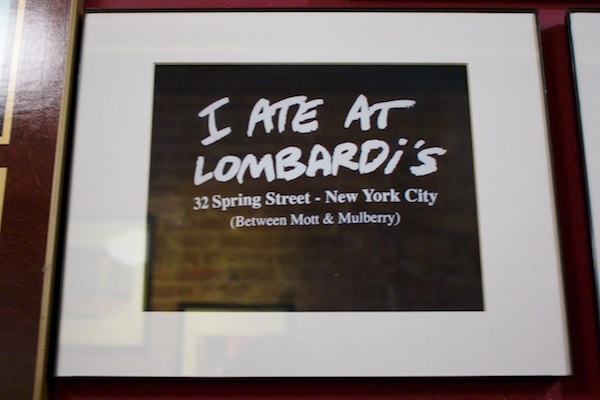 Someone recommended Lombardi's, we took note of it, and went to check out "the birth place of New York style pizza". Apparently, they don't even have a freezer, so all of their ingredients are really fresh. We got in after a 30 minute wait (not bad for New York, we're told) and sat at a table for two with a red and white checked table cloth. We drank Italian soda and shared a pretty decent pie. Thank you for the emails you've sent us with tips for your hometown or letting us know what you enjoyed on your vacations. We're so grateful that you guys stumbled on our blog and help us out from time to time. 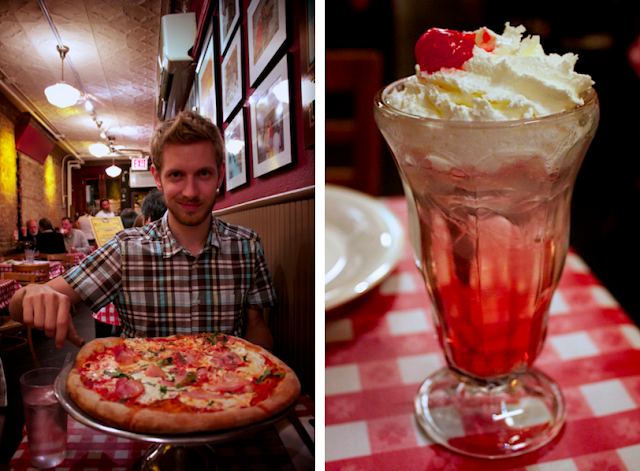 the pizza looks pretty darn good and i like the fact that they put whipped cream on their italian soda! 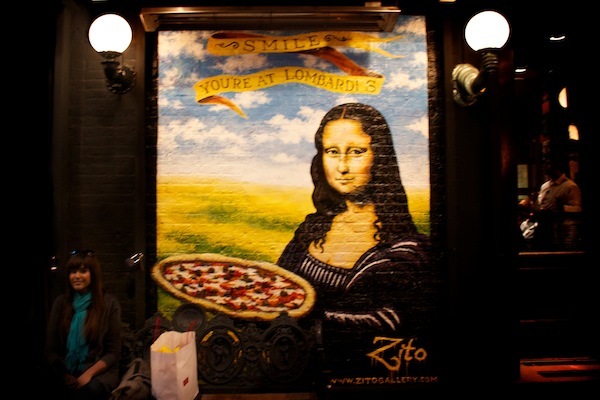 I didn't get the chance to try Lombardis while in NYC. I walked past it but we had already had dinner..and dessert. Next time! Yum that looks delicious! Recommendations from people who live there and know the city are the best! Soo delicious. Y'all are lucky for even being able to get a table there. My friend and I had to sit in the little park area next door in the cold! this stuff is mouthwatering... great shots by the way! Now on my list for the next time I visit NY. Which camera did you take these pics with? And how you do format them to get them so big on blogspot? Do you have to tinker with the html? I have a travel blog as well (Canadian girl living in Hong Kong and travelling the world)... Check me out! We wanted to try Lombardi's but the line up was always so long!!! One friday evening, it was 2 hours' wait! that pizza looks SO GOOD! as does the italian soda. I need to take a trip to NYC!